As our superluxe products are handmade and one of a kind stones may differ from image shown. Serving as a Jewish symbol of divine trust and protection, the Bauble Mezuzah is a modern take on an ancient religious tradition. This iconic mezuzah features a meticulously curated assortment of semi-precious and precious stones, set in a mixture of bezels and prongs in a solid unlacquered Brass finish. Each piece is uniquely handcrafted in our Los Angeles workshop and comes in a custom-made leather and fur-trimmed pouch. Matching brass fasteners are also included for installation. Crafted by artisans in Los Angeles, our Bejeweled Banded Stool features a variety of hand-selected, semi-precious stones bezel set onto a brass body. Stones include a mixture of lapis, pyrite, druzy, turquoise, malachite, & labradorite, hand picked by Kelly. 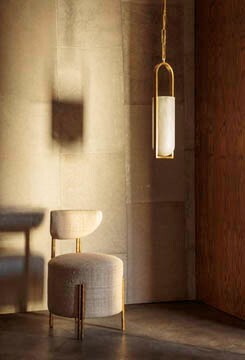 The Bejeweled Banded Stool is available in brass, which will develop a rich antique luster over time. Each stool features a completely unique collection of semi-precious stones; no two are completely alike.